The party continues at Roy Thomson Hall at the after-party for TSO Goes Late Night. Photo by John Loper and provided by the TSO. It was 11 p.m. on Saturday night, and hundreds of Toronto’s biggest music junkies headed through heavy humidity, traffic, and crowds to hear a piece of a sonic legend. But by that time, Iggy Pop was already exiting the Yonge-Dundas Square stage after his free NXNE performance. The real show was about to begin at Roy Thomson Hall with TSO Goes Late Night, a one-night-only performance of Beethoven’s Symphony No. 9 by the Toronto Symphony Orchestra and the Toronto Mendelssohn Choir. Whoever decided that the after-hours time slot was reserved strictly for rockers hadn’t spoken with Peter Oundjian, the TSO’s music director, who brought the idea of Toronto’s first late-night symphony to the TSO after conducting a similar show in Switzerland. Originally, symphonies lasted hours into the evening and audience members of all types could come and go as they pleased. Over time, that changed, and the symphony adopted the stuffy and puffy image that persists today. Now Oundjian has got some damage control to do, with programs like tsoundcheck for concertgoers from ages fifteen to thirty-five, and performances like TSO Goes Late Night, to bring the casual back to the classical. “[The idea] is a little out there. The audience is thinking, ‘They wouldn’t be doing it at eleven o’clock at night if they wanted it to be all formal,'” he said, straightening his back and fiddling with an imaginary bowtie at the show’s after-party. “We’re redefining what we do.” Meanwhile, musicians, choir members, and the remarkably young audience members mingle to the beats of DJ CCENTURIESS and re-caffeinate with coffee and chocolate. Earlier in our Luminato coverage, Torontoist noticed how a well-known pop star like Rufus Wainwright can draw a more youthful crowd to opera, and it seems that placing a symphony a few hours later in the evening can do the same thing for classical music. Young couples, families with little kids, and teen boys in baseball caps chatting with teen girls clutching their iPhones all filled the lobby and the sold-out theatre. The popularity of Beethoven’s Symphony No. 9, the one that both reminds us of the traumatizations of A Clockwork Orange and to “Drink Milk, Love Life,” must have helped. And ticket prices as low as twenty dollars added to the youthful appeal, too. On the other hand, we also suspected the kid in the jeans and Foo Fighters T-shirt was a little lost. When Beethoven first premiered this symphony, both the musicians and audience members were in tears. But the slow beginning of this performance ran the risk of having the audience’s eyes both dry and heavy. However, as the night drew on and the music gradually built to its powerful finale, everyone shook off the Sandman and leapt to their feet immediately after the final note. One should hope a rock show would evoke the same excitement at any hour. 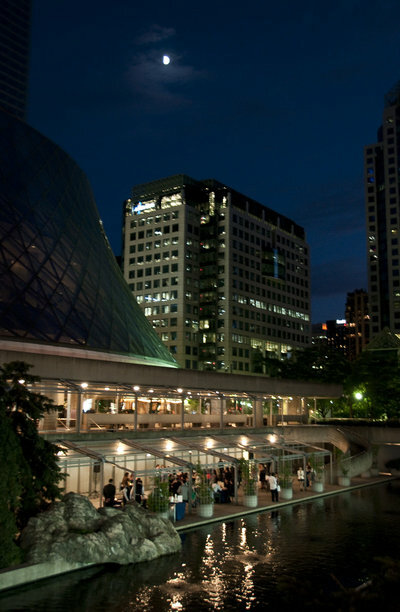 The TSO will host another TSO Goes Late Night concert in next year’s season [PDF], featuring Mahler’s Symphony No. 5.